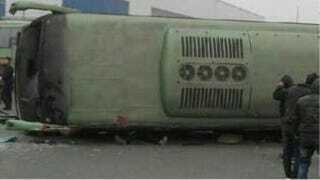 This afternoon in China's Zhengzhou, a pair of Foxconn buses were involved in a fatal crash. According to reports, at least seven were tragically killed, and twenty were injured. One bus was hit hard enough to be knocked on its side. Foxconn assembles a wide array of hardware, from the iPhone to the Wii U as well as the Xbox 360 and the PS3. Last year, Apple CEO Tim Cook visited the Foxconn factory in Zhengzhou. As website TechInAsia points out, this factory is said to produce the majority of iPhone handsets.